Proceeds from these performances will go directly to IAMPV (Instituto de Artes Musicales Puerto Vallarta) an organization that provides musical education and performance opportunities to PV children. Puerto Vallarta, Mexico - A very exciting musical event will be happening at Incanto Theatre on February 17 and 24. 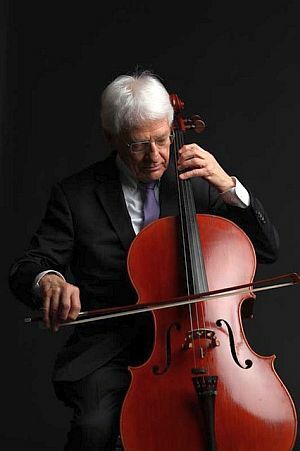 Donald Moline, a Grammy Award winning cellist who played with the Chicago Symphony for 39 years and who has a distinguished orchestral, chamber music and recording career will be playing a recital. Mr. Moline will be accompanied by Jean Guy Comeau who many of you know as one of Vallarta's most accomplished musicians. Of special significance is the fact that Mr. John Henry Kreitler,a 10-time EMMY-winning composer of concert, film/TV and theatre music and who resides part time in Mismaloya, has written Canciones de Vallarta, a suite for cello and orchestra that will be given a world premiere at this recital. Proceeds from these performances will go directly to IAMPV (Instituto de Artes Musicales Puerto Vallarta) an organization that provides musical education and performance opportunities to the youth of Puerto Vallarta. Tickets can be purchased online at incantovallarta.com. I recently asked Donald Moline about the benefits of training children in classical and other forms of music, and he replied, "As a teacher for nearly 60 years, I believe the value of music study for young children is incalculable and profound. So many different skills are learned in the study of music: eye-hand coordination, motor skills, coordination between left and right hands, the element of problem-solving, listening skills, and group interaction. Additionally, young people who study music get better grades in school and get into far less trouble. Coincidentally, the same music skills can benefit aged people at the opposite end of life. Studies of senior citizens who play music have found that mental acuity is maintained and enhanced, and senility is either postponed or prevented altogether. Music study is magical!" The International Friendship Club (IFC) supports IAMPV, because fostering cultural activities for children is a very important part of the club's mandate and its members agree with Mr. Moline that learning music makes kids better. The Director IAMPV is Daniel Oliveros, a young, devoted musician who is dedicated to developing other professional musicians in Puerto Vallarta. As well as directing the PV Chamber Orchestra, Daniel also visits schools here to explain the benefits of learning music to the teachers and to recruit children into the Salty Paw Jazz Orchestra, which is an important component of IAMPV. 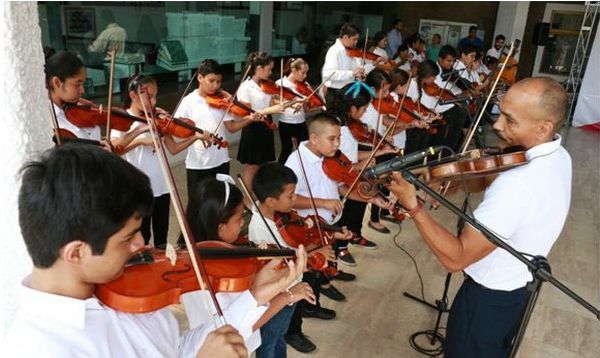 Daniel obviously has a good eye to spot kids with talent because four of the students who left Puerto Vallarta for Mexico City last summer were accepted into the very top music schools in Mexico. What an achievement! The Salty Paw Jazz Orchestra has over twenty kids under the direction of Kris who not only chooses the repertoire but also has to re-write many of the pieces to include music for violins, French horn and flute - not the instruments usually found in a jazz line-up. In addition to Daniel and Kris, there are instructors for the violin/viola, an instructor for the cello and one for the flute, sax & clarinet. As well as the IAMPV, the International Friendship Club provides treatment and care to infants born with cleft palates, free dental care in Boca de Tomatlán and financial assistance to twenty charities in town. A majority of all money raised by IFC comes from the operation of the Puerto Vallarta Home Tours. Tickets for the IFC Home Tours are only available online at toursforvallarta.com and at the Sea Monkey Restaurant on Tuesday and Wednesday mornings. IFC members not only volunteer their time but also enjoy Spanish lessons, bridge lessons, history lectures, yoga and meditation. On Fridays at 5:00 the club has a social hour followed by a popular 'Dine Around.' See ifcvallarta.com for details.